*Special thanks to C-Cyte for recording my tweets and posting them online in a post for people to view if they do not normally use Twitter. 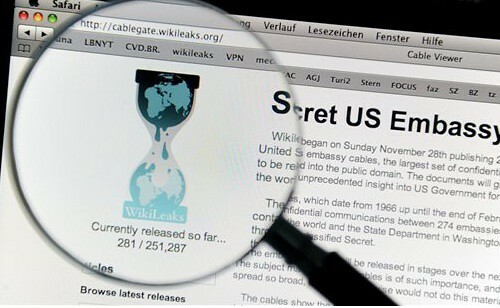 One hundred days ago, WikiLeaks began to release the US State Embassy cables. The release event, which continues, became known as Cablegate. A future post will include a look at Cablegate and what its impact on journalism, international diplomacy, and human rights has been and what its role has been in world events like the uprisings and revolutions the world that are currently unfolding. For now, it is worth recounting what has actually been revealed because of the release. One common denominator can be found in a majority of the cables: corruption. For all the talk of this country and that country being corrupt and that country being so corrupt it's gone, the plain fact is that between all the countries of the world, perhaps as a result of American coercion and/or threat of force, the world is one corrupt planet. WikiLeaks has managed to partner with 50 media outlets over the course of the past months. 5,287 of 251,287 cables have been released so far. This not only means there will likely be a 200th, 300th and 400th Day of Cablegate but also means there will be many more revelations to come in the next year. The following are 100 revelations, which this author tweeted this morning consecutively to mark the 100th Day. The one hundred tweeted revelations are dedicated to alleged whistleblower and hero Bradley Manning, who is currently being abused and humiliated in a military brig in Quantico, Virginia. He has been denied a right to a speedy trial. He has been issued charges but yet the military and government has taken its time with his case. And so, he has been detained and imprisoned since June and, most recently, the military started to force him to sleep naked at night. If Manning released the material (and he is charged by the military with releasing the cables), it is he who has given us the privilege of reading about what the US government and foreign leaders have been up to for the past years. Manning, if he is the whistleblower, has helped usher in an era of openness and transparency that has shaken the world of diplomacy, international relations and journalism. If you would like to continue to mark the day, see Greg Mitchell's blog on The Nation . He has been live blogging WikiLeaks and covering Cablegate revelations for the past 100 days. So, today, he marks his 100th day live blogging WikiLeaks (and writes about the day that Cablegate swung open). The Nation has put together this slide show to also mark the day. And, if that's not enough, there's WL Central, where you can get more of the latest news and updates on Cablegate, protests/uprisings, and more. x7o put together this fine compilation of Cablegate resources for anyone wanting to stay completely up-to-date on the latest released cables. Submitted by siafu (not verified) on Wed, 03/09/2011 - 19:57. Good list, except that #'s 35 and 51 are the same thing. Submitted by auralee (not verified) on Mon, 03/07/2011 - 22:31. Re- the corruption you mention, while looking over these, I was struck with how much effort's been devoted by various gov'ts to get other gov'ts not to prosecute their own crimes -- instances in which Assange's characterization of secretive gov'ts' behavior as "conspiracy" is fully justified. Bad enough that those in power within a nation conspire among themselves, but what we're seeing is that the elites of many nations conspire with one another against their own peoples. These are the real "traitors." Submitted by rhill (not verified) on Mon, 03/07/2011 - 20:48. Great compilation, an excellent article to keep as a reference for when the anti-Wikileak people try to argue that there is no information of interest to the public in the leaked diplomatic cables. Submitted by kgosztola (not verified) on Mon, 03/07/2011 - 21:54. Maybe WL Central should file this away under the "Resources" tab for future reference. Submitted by x7o on Tue, 03/08/2011 - 00:25. It really is a great list!